Director Alexander Payne sure has a knack for giving us quirky characters and showing us their relationships with their friends and families. With Oscar winning films like ‘Sideways‘ and ‘The Descendants‘, Payne is still in tune with his generational comedy routine, warts and all. This time around, ‘Nebraska‘ is on a more somber note than his previous work, but still manages to fill the theater with laughs as we witness a black and white screen of a family road trip film of sorts, that showcases a family’s appalling attitude when one seems to have hit the jackpot. With an impressive cast led by Will Forte and Bruce Dern, I expect decent returns at the box office, riding on the coattails of Payne’s previous work, however this stands on its own and should garner some awards come Oscar season. 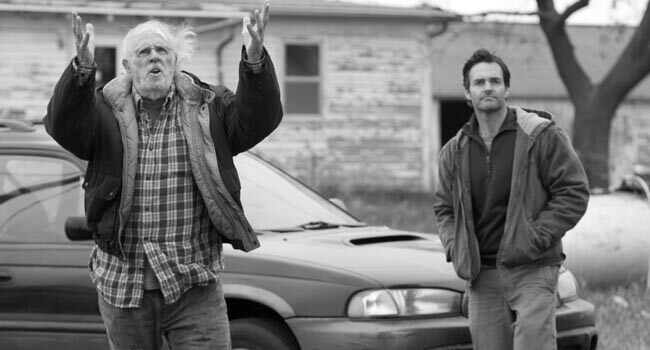 CLICK HERE TO READ MY FULL REVIEW OF ‘NEBRASKA’!!! I believe Payne chose to shoot the film in black and white, to show this small mid-western town has been pushed aside and left for dead. Business are closed left and right, and people in town seem to be on their last leg. Also, the beautiful black and white cinematography might by a metaphor for the foggy mindset and depressing events plaguing this family, but in the end, we know that family is stronger than anything. Dern never overplays his senility and at times, he shows that he still sharp as a tac. Forte turns in an amazing performance as a depressed man who is desperately trying to enjoy life, and he just might on this journey with his dad. But June Squibb steals the show here. Here delivery, comedy, and eye rolls kept me laughing out loud for the entire film.’Nebraska‘ is another hit for Payne, that is chock full of great characters, wonderful and hilarious dialogue, and solid performances by everyone. You’ll want to see this movie more than once. CLICK HERE TO WATCH OUR FUN INTERVIEW WITH WILL FORTE!! This entry was posted on Friday, November 15th, 2013 at 11:06 am	and is filed under Film, News. You can follow any responses to this entry through the RSS 2.0 feed. You can skip to the end and leave a response. Pinging is currently not allowed. « Fernando Knows What Film Will Win ‘Best Picture’ At the Oscars This Year!! !